On the interior front, the Linea Classic lacks quite a lot of equipment you will find in cars of a similar price. Manually adjustable rear view mirrors aren’t very welcome at this price point as even hatchbacks are now coming with electrically adjustable ORVMs. Cost cutting is evident at several places. Although the car has four power windows, the driver side door has controls only for the front two power windows. The classy white Linea cluster is missing too but what’s really shocking is the spare wheel, which is a space saver of size 165/80/14, when the car runs on a tad bigger 175/70/14 tyres. Other things missing include keyless entry, USB and Bluetooth connectivity, steering mounted audio controls, etc. On the brighter side, Fiat has retained one touch power windows, twin glovebox, multi-information display, follow me home headlamps and rear centre arm rest on the Linea Classic. The vehicle also turns off the headlights on its own if you forget to do so. Space inside the cabin of the Linea is generous although the sloping roof line does eat into the headroom of rear seat passengers. The seats are firm but comfortable and the visibility all around is good too, thanks to the large glass area. Fifth passenger isn’t going to be comfortable inside the Linea as the hump is significant and the seat back has the arm rest.Fiat makes some solid cars and the Linea Classic is no exception. The vehicle feels well put together and the doors shut with a resounding thud. The AC is a chiller and the audio system offers decent sound quality. The Linea is the only car in its segment which comes with double-blade wipers which clean the windshield brilliantly. So as far as the cabin goes, the Linea Classic does offer more than its rivals with more solidity and a generous boot which can hold 500-litres of luggage. This series is offered in both diesel and petrol versions. The 1.3-litre multijet diesel engines have a displacement of 1248cc. It has four cylinders and sixteen valves, which are arranged based on a dual overhead camshaft valve configuration. A maximum power of 75bhp at 4000rpm and a peak torque of 1750rpm is generated. It runs on a common rail based direct injection fuel supply system and delivers a mileage of 16.2 Kmpl in city conditions and about 19.5 Kmpl on runways. It is mated with a 5-speed manual transmission gear box and is efficient in reaching 100 Kmph mark in 13.6 seconds and a top speed of 165 Kmph. Whereas, 1.4-litre petrol mill with a displacement of 1368cc has four cylinders and sixteen valves. These are based on a double overhead camshaft valve configuration. Running on a multi point fuel injection supply system, a mileage of 11.4 Kmpl under city driving conditions and about 14.9 Kmpl on highways can be expected. This motor can produce a power of 88.7bhp at 6000rpm along with a torque of 115Nm at 4500rpm. It has the ability to reach top speed of about 165 Kmph and with 12.6 seconds it can breach the 100 Kmph mark. Its 1.4-litre petrol engine combined with a multi point fuel injection supply system delivers a mileage of 11.4 Kmpl under standard driving conditions. Whereas, on bigger roads, this figure goes up to 14.9 Kmpl. When it comes to the 1.3-litre multijet diesel mill, which runs based on a common rail direct injection fuel supply system. A fuel efficiency of about 16.2 Kmpl in cities and 19.5 Kmpl on highways.Based on a double overhead camshaft valve system, its diesel motor produces a maximum power of 74.9bhp at 4000rpm. While, a torque of about 197Nm at 1750rpm can be expected. On the other hand, petrol engine has a displacement capacity of 1368cc. This is capable of generating 88.8bhp at 6000rpm and 115Nm of a peak torque at 6000rpm. The Linea Classic offers superb handling and ride quality. There is ample low and high speed comfort alike. The suspension setup is slightly firm and slight thuds can only be felt once in a while though rough roads are handled impeccably by the car. There is better grip and cornering is also pretty immaculate. The steering responses are accurate and the car handles pretty well actually. Now arrives the crucial question. 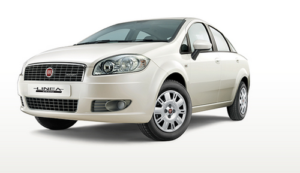 Does the Fiat Linea Classic make for a compelling case in the C-segment? We certainly think so. Amongst a sea of me too sedans, the Linea Classic offers a genuine European feel with its tank like build quality, attractive exterior styling, excellent ride quality and most importantly bigger dimensions. While the regular Linea Active is priced Rs. 75,000/- more than the top spec Linea Classic Plus, the latter is more feature loaded making it good value for money. The Linea Classic isn’t as loaded as similarly priced Japanese compact sedans but it has a definite character and that’s what makes it worth considering. With Fiat now finding its foot with a wide number of dealerships and the company offering a class leading 3-years/1 lakh kms warranty, there is no reason why admiration isn’t guaranteed with the Linea Classic.